This post just made me want to grab my credit card, place a huge order on Amazon and then bolt myself inside for days until I've finished reading, haha. All of these sound really interesting, I'm curious to see how you get on with them! So happy to see Oscar Wilde & Ginsberg & Beckett on the list, you do have a marvelous taste in literature! <3 Since I am almost done with my uni degree, I will definitely have more time to read more literature than science books again in Summer :) I can also recommend Sylvia Plath's poetry and her diary collection. I'd think of some other recommendations, but I gotta get going right now - aaah, always too late for my lectures :S take care! Sobbing uncontrollably is definitely the main reaction to reading Flowers for Algernon. I've just finished my final university exams and getting back into reading without taking notes or stress is something I'm enjoying so much. Good luck with your list! This is such a lovely list Jennie, there's quite a few on here I'd love to read! I couldn't get into The Picture of Dorian Grey but keep meaning to try again, and I really want to read It's Kind of A Funny Story. This is such a wonderful idea for a post! I cannot recommend the Five People You Meet in Heaven enough - it is just the most beautiful book. It's so well written and a wonderful, wonderful story. PS - completely agree about msn - I shudder about the hours I lost there! I adore reading. It's definitely been put on the back burner since having my son back in January but now that we're falling into more of a routine I'm hoping to read a lot more. Over the past 3 years I've been reading 50 books a year which has felt amazing. Though I know I wont hit that target this year I don't mind because I'm really enjoying being me right now. I love falling into the worlds of others but I think when you're enjoying where you are right now, then it's ok to step back for a little bit. I never thought I'd say that but it's definitely the way I feel right now. Out of the books your wanting to read I've only actually read one which is More Than This by Patrick Ness. I adore Patrick Ness' writting style and devoured this book. Definitely one of my favourites right now. I read The Five People You Meet in Heaven once for a class - it was interesting, but a little confusing at the same time. I really liked The Last Lecture by Randy Pausch, and now that I mention it I might give that a go again. It's just too bad that I don't read as much as I used to, anymore. I'm always so fascinated by what other people read, as I find my own taste quite restrictive. Modern novels is where I lack but I'm trying to improve this. It's Kind of a Funny Story, Flowers for Algernon, and Five People You Meet in Heaven sound like books I need to read. I tried watching the film adaptation of It's Kind of a Funny Story but I'd rather read books first. Waiting for Godot is rather good! I've read It's Kind of a Funny Story and Girl Interrupted and honestly they're so much better than the film adaptations. They're both excellent reads. wow you have a pretty fantastic list over here! I couldn't agree more, reading is absolutely essential in my life! I love these book posts Jennie, I've stopped reading for a few months but I definitely need to get back into it! I always look forward to your book recommendations. Added this post to my Weekend Reads post going up tomorrow. Hope that's ok :) Have a lovely weekend Jenny! 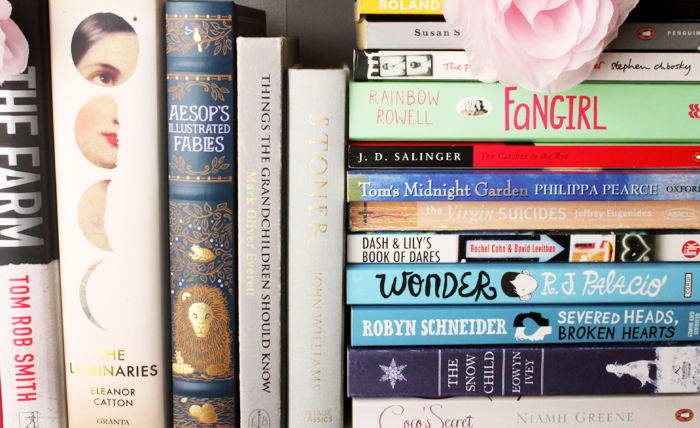 There are some seriously awesome books in that picture and list! Many I have read and others I haven't. My favourite I would have to say would be The Catcher in the Rye and I would love to read Dash & Lily's! Your words are so true Jennie, reading is so important and you summed it up perfectly; there's nothing better than submerging yourself in another world for a while. Reading is so vital, so important. I can't count how many times I've heard someone say they've never read a book, not one! Often those people say it's boring, and all I can think is 'what a waste'-- reading is amazing, and this post proves that! SO many good books here, and you're right reading is so important and so much fun as well. Rebecca is one of my all time favourite books - I hope you enjoy/ed reading it! you have some of my favs and some of my must reads here too. i've seen the movie rebecca but would like to read some of her books. The Fault in Our Stars is so good, I've read it twice. Cried both times! LOVE this sort of post. I need to do one, I keep buying books but can't seem to keep up with reading them. Maybe that will help! I'm currently reading "A Hundred Summers" which seems to be the ultimate New England girl's summer read--luxe locations, gorgeous-sounding boys, typical gossip, and a great romance. You should at it to your list!